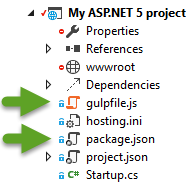 DNX packages aren’t restored automatically when building a project based on the ASP.NET 5 preview templates shipped with Visual Studio 2015, preventing the projects from compiling when first used. This means it’s sometimes necessary to open a PowerShell console and run package restoration manually using the DNX utility, depending on whether or not all the project dependencies are available in the local DNX package cache or not. The following is an example of a Gulp task which calls dnu restore before each build, which restores all required DNX packages automatically. It should be trivial to port the functionality to other task runners. Note: In case there’s a simpler way to enable DNX package restoration, please leave a comment and point me in the right direction. My Google skills haven’t been up to the task of finding any useful documentation regarding such a feature/build step/magic button. If you haven’t done so yet, add a package.json file to your project to include e.g. Gulp, Grunt or whatever your favorite node.js task runner might be, along with a corresponding build file (e.g. gulpfile.js, gruntfile.js). The task named “restore-dnx-packages” executes PowerShell.exe dnu restore via a helper object before each build. // Change this path to match the location of "global.json" in relation to the location of "gulpfile.js". // Whether or not it's necessary to set the PowerShell execution policy depends on your local settings. // Read the SDK version from "global.json" and run DNU restore using that framework version. Since DNX caches packages locally running the task before each build doesn’t incur a noticable increase in build time. Done running "PowerShell.exe dnu restore". Child process terminated with code 0.